It’s a jungle out there. The rain and floods we’ve endured this spring have been a two-edged sword – or rather, digging knife. Some flowers are blooming profusely: hellebores, forsythia, columbine/aquilegia, roses, clematis, heuchera. Weeds, however, are growing like… well, weeds. And because it rains ever other day, I’ve found it really, really hard to get out there and yank up the darn things. Last time I had a weed-pulling marathon, I nearly had to take to my bed with aching knees, shoulders and hands. But battling weeds is more important now than ever. 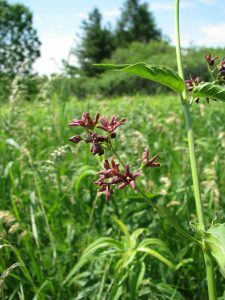 Not only do they take up valuable real estate that we’d rather use for our favourite plants, but many weeds are literally enemies of our native ecology. “So what?” some people say. “They’re green, they soak up carbon dioxide, they produce oxygen.” And that’s true, as far as it goes. But that’s about all those invasive weeds do. They’re the layabouts of the landscape world. Meanwhile, our hardworking native plants are busy feeding native insects, including pollinators. The bugs and even the plants – their seeds, anyway – themselves become food for birds. The birds return the favour by spreading seeds that become new plants and by keeping the insects from devouring their plant hosts. You’ve seen The Lion King and thrilled to the music of “The Circle of Life”? The circle is everywhere, even right in our backyards. It turns out nature doesn’t stick strictly to the slogan “survival of the fittest.” If that were true, we’d end up with “a world populated by pigeons, Norway maples and cockroaches,” says Colleen Cirillo, director of education at the Toronto Botanical Garden and member of the Ontario Invasive Plant Council (OIPC). We humans are learning as we go, but nature’s balance is a whole lot more complicated than most of us think. “Insects all have these incredible stories to tell,” Colleen says. They don’t have any natural predators here. They survive in many different growing conditions. They produce lots of seeds that scatter far and wide. They can also spread by underground roots that re-grow easily. Sadly, even some of our garden plants qualify for that label of shame. Lilies of the valley are demons – don’t plant them unless you can control them. Periwinkle/vinca minor is a common ground cover that covers everything it can. Cuttings dumped in some of our ravines are crowding out our wild ginger and even tree seedlings. And we all know the trouble Norway maples cause. Don’t dig up dog-strangling vine unless you can get out every bit of the deep and wide-ranging roots. Dog-strangling vine – An upright, twining plant that lives forever and spreads like a sneeze. Tiny flowers form seedpods in July and August. Particularly evil because Monarch butterflies will lay eggs on it, but their caterpillars can’t feed on the leaves. Control by digging out the entire root of first-year plants or by cutting the vine back to ground level. Pulling is NOT recommended, because the beast re-grows from the broken roots left behind. Garlic mustard – A sturdy biennial with heart-shaped, toothed leaves and delicate white flower clusters that bloom in the plant’s second spring. Watch for first-year plants that look a bit like coarse, flattened violet leaves. Pull small patches out by their skinny taproots or starve them by cutting the stem at the base as needed. 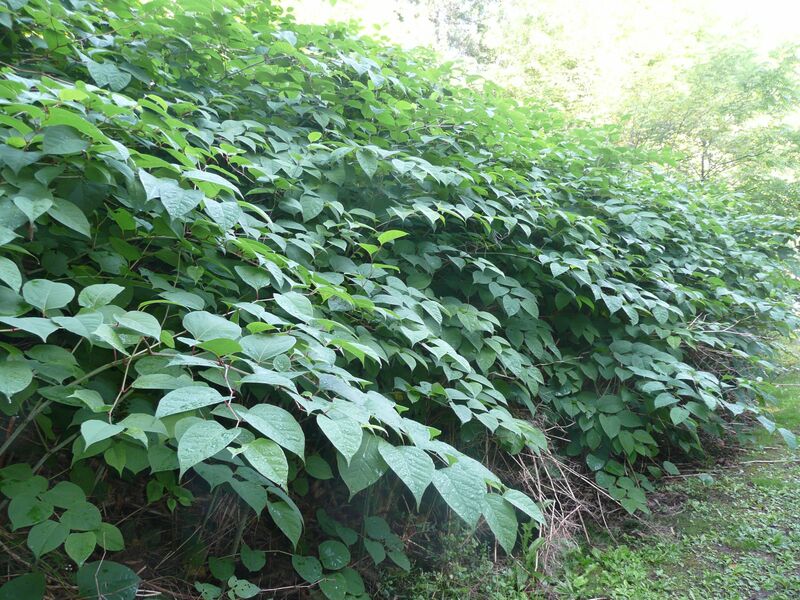 Japanese knotweed – A bamboo-like perennial with heart-shaped leaves and thick, hollow purple or green stems. It’s fast-growing in stubborn clumps and makes sprays of white flowers in summer. If possible, dig out every bit of the fat root. Otherwise, sharpen your clippers and keep it cut back to the ground. For additional info and helpful tips on invasive plants, see www.ontarioinvasiveplants.ca/resources. Ah, summer – it’s berry time!